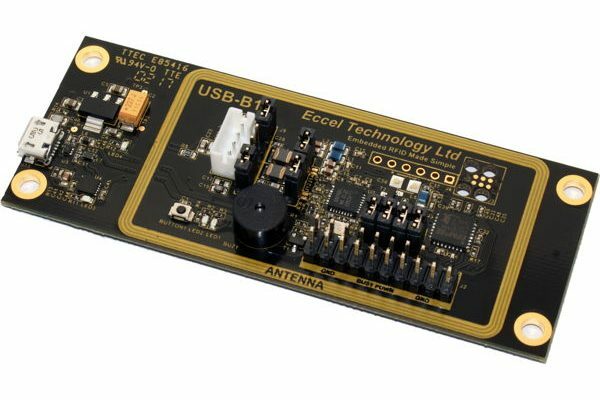 The USB-B1 is introduced as both an evaluation board for the RFID-B1 module, and as a stand alone fully functional USB connected RFID reader. It offers full access to all of the features of the RFID-B1 module such as 128 bit AES encryption of data, ADC, DAC, PWM, comparator, voltage reference generator and a temperature sensor. The interface is USB which presents itself to the User’s computer when connected as a COM port. All power is derived from the USB connection. Jumper links are provided for flexible and easy connection of all RFID-B1 inputs and outputs and peripherals as well as useful development features such as LEDs, a buzzer and a switch. This product is available now via our website or via our worldwide sales partner, RS Components under their article number 126-2178.